In recent years the seaside "U-shaped" Hippodrome (Greek)/Circus (Latin) mentioned by Josephus has been uncovered by archaeologists. Located north of the Promontory Palace and south of the Crusader Fort this structure was initially built by Herod the Great (37-4 B.C.). It was 950 [290 m.] feet long and 165 feet [50 m.] wide. It was curved at the south end. On the east side, 12 rows of seats arose above the 5.5-foot high wall that separated the audience from the events in the arena. Variously called by Josephus an amphitheater (Ant. 15.341 [9.6]) or a stadium (Wars. 2.172-74 [9.3]) it seated about 5,000 spectators. In all probability, the Caesarea games initiated by Herod (11 B.C. ; Ant. 16.136-41 [5.1]) were held here, and it may have been used for chariot racing as well. 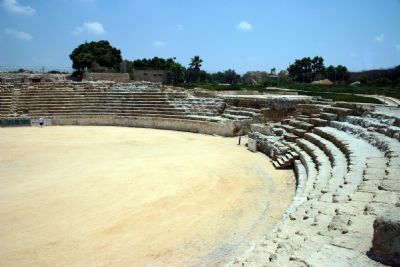 In the second century A.D., a much larger (30,000-capacity) hippodrome was constructed in another section of Caesarea and the southern third of the Circus was converted to an Amphitheater that was used for gladiatorial contests. Eventually, a real amphitheater was built and this seaside structure went out of use in the third century A.D. This may have been the stadium where, in defiance of Pontius Pilate (who ruled Judea A.D. 26-36), the Jewish leaders were willing to submit to the sword rather than have ornamented Roman standards in the city of Jerusalem. Pilate eventually had to back down, according to Josephus (Ant. 18.55-59 [3.1]; Wars. 11.169-74 [9.2.3]). In addition, this amphitheater (or the theater) may have been the spot where Herod Agrippa I was struck with an illness that led to his death (Acts 12:19-23; Josephus Ant. 19.343-52 [8.2]).